Fracture mechanics is the study of the nucleation and the propagation of cracks in materials, which includes both stable and unstable (rupture) crack growth. The subject allows for the quantification of the relationships between material properties, stresses, the presence of crack-producing flaws, and crack propagation mechanisms. In modern materials science, fracture mechanics is an important tool used to improve the performance of mechanical components. Fracture mechanics is used in fitness-for-service assessments, which analyzes flaws to determine which are safe and which are liable to propagate and cause failure of a flawed structure. Fracture toughness is a mechanical property which measures a material’s resistance to brittle fracture when an existing crack is present and is subjected to monotonic loading. There are various fracture toughness parameters that are measurable and used in engineering analysis. In practice, these parameters are generally narrowed down to 3 types: KIC, JIC, and CTOD. 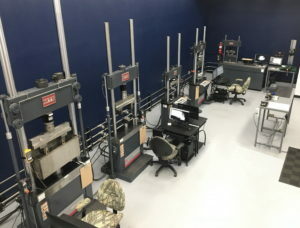 Accu-Test Labs uses advanced mechanical testing instrumentation and methodology in the determination of these fracture toughness parameters. KIC testing evaluates the fracture toughness in the linear-elastic plane strain condition and must have sufficient specimen thickness in order to meet the plane strain condition. KIC is a measure of the critical stress intensity factor, K, under mode I loading (crack-tip opening under tensile loading) which causes sudden brittle fracture. JIC testing evaluates the fracture toughness in the elastic-plastic condition and has much less constraint on specimen thickness than KIC. JIC is a measure of the critical J-parameter, which measures the energy required to propagate a crack, under mode I loading. Crack-Tip Opening Displacement (CTOD) testing measures the opening displacement of the crack-tip which drives crack extension. It is used for materials which display some plastic deformation before sudden brittle fracture occurs.